The Fredericksburg is an eight-foot; seven-person state of the art Spa system offers 112 various style stainless steel hydrotherapy jets. This two pump 12 HP dual-valve power plant provides five individually adjustable hydrotherapy zones for unmatched relaxation. The seats are designed in this tub to fulfill your hot tub experience with its captain's chair, and its counter part the captain's lounge, two deep corner bucket seats and two multi-level jump seats along with our super power bank foot-well design for the utmost calf and foot massage. Our cathedral staircase provides easy access in and out as well as an optional cool down seat for the seventh person. This Spa comes standard with our Motion Glow Lighting system, a 9-bulb color rotating underwater LED light and individual LED lights located along the top of the spa. This computerized light system allows rotation between 10 different display modes, providing aesthetic deck accent and atmosphere for evening use. Combine all this with our maintenance free Permawood Cabinet, our Thermo Service Foam Insulation System and Lucite Luster color acrylic for the ultimate 21st Century Spa. Spa will arrive within 3-5 weeks from the time payment is received. Preview other special order spa colors. 93" x 93" x 39"
Visit the manufactures website for full warranty details. All our spas use a Thermo-service-foam insulating system. The system encapsulates a pocket of still air, which reflects heat loss from the sides, back into the tub, to maximize heat retention and minimize energy cost. This type of insulation is known as barrier insulation and is preferred over solid-fill foam systems because of its cost effectiveness and ease of trouble-shooting service issues. Spa Guy offers the highest quality thermal cover on the market today. All covers come with a full four to two inch design for water runoff, four locking straps to keep unwanted guests out, and aluminum reinforcing c channel with two pound high density foam for safety and strength. 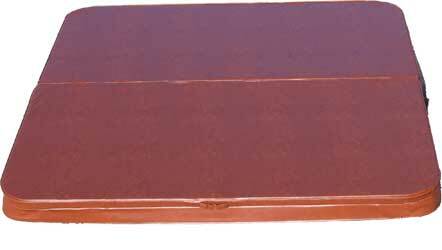 These covers meet or exceed all ASTM safety standards and are UL classified. A waterfall provides both soothing sounds and neck massaging comfort. The waterfall jet is a cascade of water with its own control so you can choose a gentle or powerful massage. Maintaining clean balanced water is virtually effortless. Our pressure filter uses the power of the jet pump to forcefully push the used water through the deep pleats of the filter cartridge, which ensures clean and balanced water. 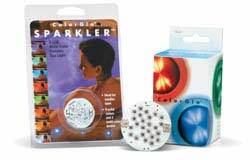 The following options are included FREE with the purchase of your new spa. 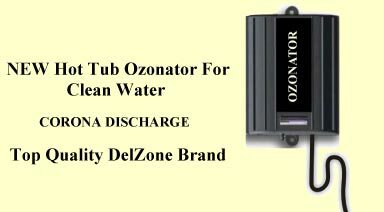 The use of chemicals will be cut down to the bare minimum with our advanced corona discharge ozone sanitation system. This technology injects all natural ozone into water chamber oxidizing contaminants and returning the purified water into the spa through dual ozone jets. Keeping your spa clean and pure is simple with an ozonator. The brilliant surface of the stainless steel jet offers not only a classy but, a very vogue look with a durable finish that remains beautiful for years on end. Providing both soothing sounds and neck massaging comfort, the waterfall jet is a cascade of water with it's own control, so you can choose;gentle or powerful. Our delivery service is unlike anything you will find on the internet. We have professionals who are trained in moving spas. This enables us to get your new spa to you in one piece. Nothing can be more frustrating than having your new spa arrive at your house broken. We have the best delivery record on eBay with most of our items arriving in under the promised shipping time. This spa includes over $1875 of upgrades FREE!! Due to its size your spa must ship with a LTL freight carrier. Shipping rates are based upon your state of residence. (See Map Below) Please note that we can only ship within the continental United States. Shipping charges are non refundable. The freight company will unload the spa curbside. In order to ship your spa the freight company requires two phone numbers where they can reach you to schedule the spas arrival. You are responsible for inspection of the item at time of delivery and noting any type of damage on the delivery sheet. If damage is not noted on the delivery sheet, you will be responsible for replacement and related shipping costs. Payment is due before your spa can ship. We accept Visa MasterCard, Check and Money Order. Check and Money Orders should be mailed to the address on your receipt. If you would like to pay over the phone using Visa or MasterCard or have any questions, call us toll free at 866-771-4897 or 757-855-0381. Our hours are Monday-Friday 9-5 EST.